Warriors center Andris Biedrins will get more opportunities to shoot this season. Over the past 10 years, the NBA has truly become an international game. Players such as Yao Ming, Tony Parker and Manu Ginobili are only a few of the many international stars who now call the NBA home. International players made up a little more than 12 percent of 2006 opening-day rosters. Golden State has been at the forefront of the international movement, selecting foreigners first in the draft in three of the past five years. Rookie Marco Belinelli and center Andris Biedrins are two of seven Warriors born overseas on Golden State's preseason roster. Foreign players figure to be key components for Golden State as it looks to return to the playoffs for a second consecutive season. While Belinelli still gets comfortable in a new setting, Biedrins has finally started to find some success after much initial hardship. Golden State center Andris Biedrins has a pretty good idea of what rookie Marco Belinelli is going through. Three years ago, Biedrins was the one in Belinelli's shoes, trying to fit in during his first training camp in a place far away from his home in Latvia. 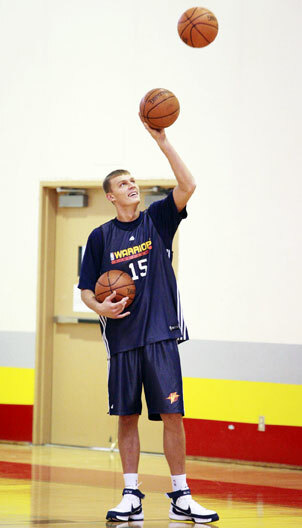 "The first day, the first week, basically the first year was hard," Biedrins recalled. "New country, new language, new friends, it was new everything. It wasn't easy." Biedrins' situation was a little different, however. He was 18 years old and drafted as a project as Golden State looked to the future. That rebuilding phase may be completed, as the Warriors ended a 12-year playoff drought last season, but there's more to be done in the coming campaign. The 21-year-old Belinelli was drafted 18th overall this season. But unlike Biedrins, he won't have time to get comfortable in his new surroundings. Golden State traded last year's starting shooting guard, Jason Richardson, partly because the front office believed the Warriors stumbled upon a hidden talent in Belinelli. He is expected to step in and play from the start. "He's going to be a very good player," Warriors coach Don Nelson said. Despite his young age, Belinelli already has gained valuable experience. He spent five seasons playing professionally in Italy, where he averaged a career-best 16.4 points per game last season. His impact with the Warriors was felt right away. In his first summer-league game with the team, he exploded for 37 points on 14-for-20 shooting and was 5-for-7 from behind the line. He's a deadly shooter off the dribble and can handle the ball. He loves to get up and down the court, which is part of the reason he is happy with the situation he is in. "On this team we run a lot, and I like to run," Belinelli said. Andris Biedrins: Warriors big man is finding NBA success after a slow start. Golden State wrapped up its third day of training camp yesterday at the Cannon Activities Center on the BYU-Hawaii campus. Belinelli hasn't had much time to bond with his new teammates and spent most of the last minutes of practice yesterday shooting on his own. Biedrins knows the feeling because it also took him a while to fit in. He hasn't had a chance yet to spend much time with Belinelli, but says he is looking forward to it when he can. 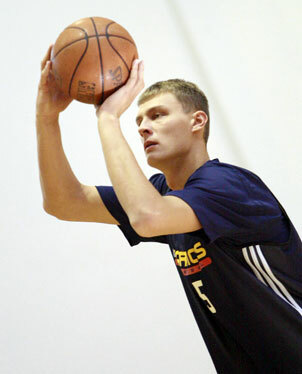 "In this training camp I will have the opportunity to meet him and see what kind of person he is," Biedrins says. "The toughest part about (the transition) is being alone and not knowing anyone." The 6-foot-11 Biedrins is coming off a season in which he more than doubled his points and rebounds averages. Biedrins didn't see much time on the floor for former coach Mike Montgomery, but says things changed when the Warriors brought in Nelson. "He told me if you play and do the things I tell you to do, you will be starting in the game," Biedrins said. "It really made me confident that the coach feels good about me." He started 63 games for the Warriors and ranked 25th in the NBA with 24 double-doubles. He averaged double figures in points and rebounding and nearly two blocks a game as a starter. He also led the league in field-goal percentage, and says he spent the offseason working on improving even more in that area. "The main thing has been working on my offensive game," Biedrins said. "I'm also working to get quicker and stronger, but mostly it has been improving my offense around the basket." him a few more chances on the offensive end this season. "We're definitely going to get the ball to him a little more than we did a year ago," Nelson said. "He matured nicely and deserves some catches down there." The Warriors will continue to practice two times a day in Laie as they get set for their preseason opener Tuesday night against the Los Angeles Lakers at 7 p.m. at the Stan Sheriff Center.